How much do you pay attention when you are eating? Thing is we have so much food around us these days. We eat while working, watching TV, driving, talking on the phone, walking on the street. We are so good at multitasking. Your brain is not engaged in eating. You don’t even know what is going into your mouth. Your arm just moves automatically from food to your mouth like a reflex. No signs of fullness. You need to eat more to feel satisfied. I’ve done that and been there and still do sometimes, unfortunately. I used to shovel down protein bars (evil to your body!) at work because I was “busy”. It was a pathetic excuse there is not even 10 minutes for myself, enjoying my food at work? I’m shaking my head right now. I love eating and I think it should be a healthy and pleasurable experience. Your food needs a full attention. I know it is extremely difficult to change your habit, but I’m sure you all agree with me here we need to eat “mindfully” for the sake of your own health. 1. Listen to your stomach. You need to feel hungry before you are eating, but not starving otherwise you tend to overeat. Have a glass of water to see if you are thirsty, not hungry. 2. Choice of your food. Is this going to be good for my body and soul? If a piece of chocolate makes you happy, then go ahead. Enjoy it without feeling guilty. 3. No distractions. We have a house rule. No TV while eating. It should be a couple/family time without distractions. 4. Look, smell and taste your food. 5. Chew your food and put down your fork between bites. 6. Stop when you feel about 80% full. You are not wasting food on your plate though. Keep the leftovers for later or next day. If you are not good at this (me>.<), put less food on your plate or use a smaller plate to control your portion size. 7. This is a bit Korean way, but we say “thanks for the meal” before eating at the table. It is not like a religious thing. We thank for the soil, sun, rain, farmers, etc that brought that food to the table. Be grateful! 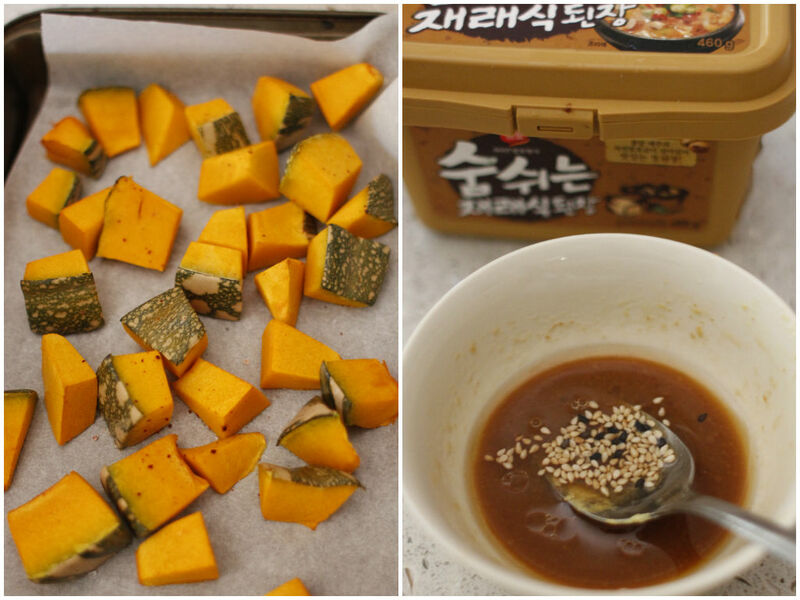 Put chopped pumpkin in a large bowl. Add melted coconut oil, cumin and salt into a bowl and toss to combine. Bake them in the preheated oven (180) for 20-30 minutes until cooked. Rinse wild rice and cover with a plenty of water in a saucepan. Bring it up to a boil and simmer on low heat for 40 or until cooked. Drain and let it cool. 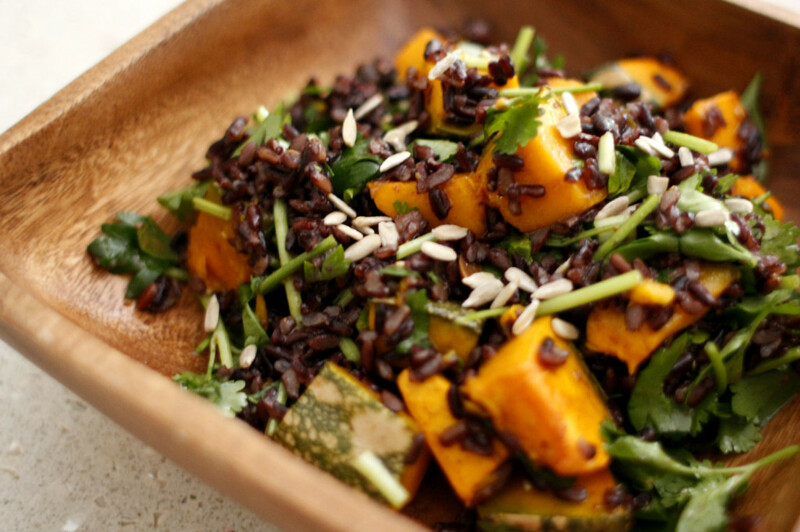 To assemble, combine cooked wild rice, pumpkin, chopped coriander and sunflower seeds in a large bowl. 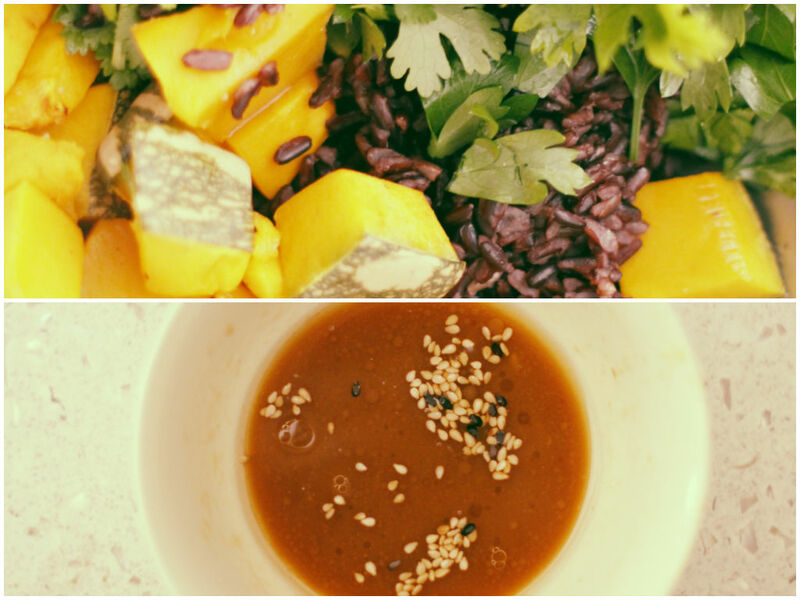 Pour the miso dressing and toss to combine. Transfer to a serving plate.